How can MyTrees.com help me write my personal history? How do I create my personal history? How can I edit my personal history? How can I view my personal history? Can I create more than one personal history? Will anyone else be able to see my personal history? How can I delete my personal history? Why does my personal history display in HTML when I edit it? What are some basic HTML tags I can use in my personal history? How can I print my personal history? How can I save a copy of my personal history? How can I share my personal history with others? A personal history is the record that one person writes about his or her own life. The purpose of a personal history is to share important life lessons, genealogical facts, and further experiences with others. As a genealogist, you may have been fortunate enough to come across such a record written by one of your ancestors. These documents can not only help us extend our family tree, but can give us precious insights into the minds and hearts of our family members. Writing your own personal history can allow your family members, as well as future generations, to have the same type of insight into your life. What type of information should be included in a personal history? Anything that you feel is important to pass onto others. A good place to start is with basic life details, such as where and when you were born. Then you'll want to record some more personal information, such as memories of your family and the place where you grew up. The number one rule about a personal history, though, is that it is your history. That means you can write about whatever you want. If you'd rather skip your childhood and talk about your later life, that's what you should do! A personal history is your chance to tell your family whatever it is that you'd like them to know about you and your life. 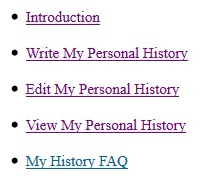 To help you get started with your own personal history, MyTrees.com has added a "My History" section to our site. The tools included in this section can help you write a personal history by guiding you through the process of recording the some basic information about yourself. Click here to start writing your personal history today. For more information, check out this article on Writing Your Personal History. We have some tools on our site that can make writing a personal history much easier. These tools can be found by clicking on the "My Account" link located at the bottom of any page on our site. From there, click on the "My Personal History" link. From this area, you can choose to write, edit, or view your personal history. When you create a new personal history, you'll be given a series of guided questions, designed to help you record some of the most basic information about yourself. All you have to do is answer the questions! When you're done, your responses will automatically be formatted into a full personal history. The edit option allows you to change the text or format of your personal history. Want to add some additional details about your wedding? Want to change something that you wrote earlier? You can easily do so from the edit screen. Your personal history will be displayed in HTML, which allows you to change the appearance and format of the text if you are familiar with HTML. If you're not familiar with HTML, don't worry! You can just ignore the HTML tags and focus on the text. When you're happy with the way your personal history looks, you can print it out for your own records or to share with your family. You can even let your family members read your personal history online by registering a Family Password. MyTrees.com makes it easy to write your personal history, so why not get started today by clicking here. Select the "My Account" link located at the bottom of the page. From there, click on the "My Personal History" link. Click the "Write My Personal History" link, located under the My Personal History area. Select your gender and age from the options listed at the left of your screen. This allows us to give you a more personalized template for your history. You will now be taken to a page of guided questions, designed to help you record some of the most basic information about yourself. The first question asks you for a file name. This is the name that your personal history will be stored under, so that you can easily find it again in your account. You can create more than one personal history, so be sure to give each history a unique name. Answer each question on this page. You will have the opportunity to edit or add to this information later. Once you have completed the questions, click the button at the bottom of the page. You will then be taken to the edit screen, where you can view and edit your personal history. You will find that the answers you supplied on the previous page have been formatted into sentences and paragraphs. You will also notice that the document is being displayed in HTML format, which means that you will see some HTML tags. These tags include any text that appears between angle brackets, such as . If you are familiar with HTML, you can edit the formatting of the document by changing or adding to these tags. If you are not familiar with HTML, you can simply ignore the tags and just worry about editing the actual text. For more information, see Why does my personal history display in HTML when I edit it? or What are some basic HTML tags I can use in my personal history?. 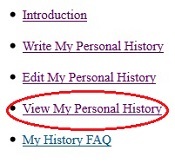 If you would like to view your completed personal history without the HTML tags, click the "View My Personal History" link, which is located in the My History menu at the left. This will show you the finished product, which you can print for your own records or share with others. For more information, see How can I print my personal history? or How can I share my personal history with others?. 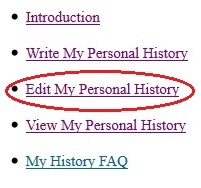 Click the "Edit My Personal History" link, located under the My Personal History area. Any personal history that you have previously created will be listed by its file name at the left of your screen, under the Edit My Personal History menu. Click the name of the history that you wish to edit at this time. You will now be taken to the edit screen, where your personal history will be displayed. You will notice that the document is being displayed in HTML format, which means that you will see some HTML tags. These tags include any text that appears between angle brackets, such as . If you are familiar with HTML, you can edit the formatting of the document by changing or adding to these tags. If you are not familiar with HTML, you can simply ignore the tags and just worry about editing the actual text. For more information, see Why does my personal history display in HTML when I edit it? or What are some basic HTML tags I can use in my personal history?. Make any changes that you want. When you are done, click the button at the bottom of the page. Click the "View My Personal History" link, located under the My Personal History area. Any personal history that you have previously created will be listed by its file name at the left of your screen, under the View My Personal History menu. Click the name of the history that you wish to view at this time. Your personal history will then display. To view your personal history in its own window, click the "Display as Separate Page" link at the top of the page. Yes. You can create as many personal histories as you like. Just be sure to give each history a unique file name so that you can remember which is which. Your personal history will not be available to the public. However, if you wish to share your history with family members, you can do so by registering a Family Password. A Family Password allows your family members to view, but not edit, your personal history. They can also use the Family Password to view your My Family Tree file, if you have one, and any information you have stored in the Family News area. Since you control who has your Family Password, you control who can view your personal history. To register a family password, go to the "My Account" link located at the bottom of any page on our website. Select the link "My Account Info" and then click on "Update Personal Information". Find the "My family password is:" field and enter a new password. Then click the SUBMIT button at the bottom of the screen. Remember, your Family Password should be different than the password that you use to login to your own account. Once you have registered a Family Password, your family members can use it to log in through the Family Access Login. They will need your account number and Family Password. You can delete a personal history any time you like. However, once it has been deleted, you will no longer be able to view or print it. So, if you wish to retain a copy of the history for your own records, please be sure to print it out before deleting it. Any personal history that you have previously created will be listed by its file name at the left of your screen, under the Edit My Personal History menu. Click the name of the history that you wish to delete at this time. Your personal history will then display. At the top of the page, you will find an option that reads, "Delete this page." Click the checkbox next to this option. Your personal history will then be deleted. Displaying your personal history in HTML allows you to edit the formatting of the document, as well as the text. If you are familiar with HTML, you can use it to change the color, font, or style of your personal history. If you are not familiar with HTML, you can simply ignore the HTML tags and just edit the text. We do plan on updating the Personal History tools as we see what would best meet our patrons' needs. One update we are currently considering is the ability to edit your history in a platform that would be similar to a word processing program such as you might be more familiar with. HTML stands for HyperText Markup Language. It is the basic language that is used for creating web pages. It allows the user to control all elements of the web page, including color, font, and size. HTML uses special tags to indicate how the web page should be formatted. HTML tags appear in angle brackets, such as . tag indicates that there should be a paragraph break. You will also see tags that control the size and color of the font and how the text should be centered on the page. If you are familiar with HTML, you can go ahead and edit these tags or add some of your own to change how your text will display in the final personal history. If you are not familiar with HTML, you can simply ignore the tags and just focus on editing the text itself. 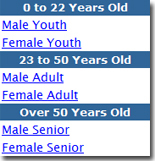 This section will include some very basic information on a few HTML tags you can use when editing your personal history. It is not intended as a comprehensive course in learning HTML. If you wish to learn more about HTML, there are many resources available online that can help you. One such resource is HTML Code Tutorial. Since a personal history is a text document, we will focus on a few tags that can help you alter the appearance of the text itself. The first thing you need to know is that every HTML tag needs to be preceded by and followed by an angle bracket. So, a proper HTML tag would look like . Let's learn how to make text bold so that we can emphasize a word or idea. You'll notice that the bolding continued for the rest of the text. If you do not include the stop tag in the proper place, the tag will effect the rest of your document. The font color tag can be altered by changing the name of the color. More advanced HTML writers use numbers to indicate specific colors. However, generally you can just type the name of a simple color as well. Stick with one word colors, such as blue, red, green, or yellow and it should work. < p >paragraph break tag, which will skip a line. paragraph break tag, which will skip a line. We hope this information will help you as you edit your personal history. If you would like more information about HTML, check out HTML Code Tutorial. There are two ways you can print out your personal history. First, you can print it directly from your browser. Second, you can copy your personal history to a word processing program, such as Microsoft Word, and print it from there. Printing your personal history from your browser. Any personal history that you have previously created will be listed by its file name at the left of your screen, under the View My Personal History menu. Click the name of the history that you wish to print at this time. Your personal history will then display. Click the "Display as Separate Page" link at the top of the page. Your personal history will now display in its own window. You can now print the document by clicking your browser's File menu and selecting the Print option. Printing your personal history from a word processing program. Follow steps 1-6 above to view your personal history. Your personal history should now be displaying in it's own window. Highlight the entire text of your personal history. The easiest way to do this is to hold down the CTRL and A keys. That will automatically highlight the whole document. Now that the text is highlighted, you need to copy it. Hold down the CTRL and C keys. That will copy the text to your clipboard. You can also use the Copy option in your browser's Edit menu. Open the word processing program you wish to use. A word processing program is one that is designed to work with text documents, such as Microsoft Word or WordPad. Once the word processing program is open, start a new document and paste your personal history into. You can do this by clicking on the new document and then holding down the CTRL and V keys. You can also use the Paste option in the program's Edit menu. Your personal history should now appear in the word processing program. Click the File menu and select the Print option to print the document. There are two ways you can save a copy of your personal history. First, you can save it as an HTML document directly from your browser. Second, you can copy the text to a word processing program, such as Microsoft Word, and save it from there. Saving your personal history as an HTML document. Any personal history that you have previously created will be listed by its file name at the left of your screen, under the View My Personal History menu. Click the name of the history that you wish to save at this time. Your personal history will now display in its own window. Save the document by clicking your browser's File menu and selecting the Save As or Save Page As option. Once you have saved your personal history to your computer as an HTML document, you can open it again to view or print it through any internet browser (such as Internet Explorer or Firefox). You can also open, edit, or print your HTML document through many word processing programs, such as Microsoft Word. Saving your personal history in a word processing program. Your personal history should now be displaying in its own window. Highlight the entire text of your personal history. The easiest way to do this is to hold down the CTRL and A keys. That will automatically highlight the whole document. Your personal history should now appear in the word processing program. Click the File menu and select the Save option to save the document. Once you have saved your personal history, you can open it again using the same program. You can also edit or print your history from that word processing program. There are several ways that you can share your personal history with your friends and family members. You can print it out, save it to your computer, or use a Family Password to allow your family to view it right on our site. If you want to give your family members a hard copy of your personal history, you can just go ahead and print it out. For specific instructions, see How can I print my personal history? You can also save a copy of your personal history to your computer. Once you have saved it, you can attach it to an email or burn it to a CD in order to share it with others. For specific instructions, see How can I save a copy of my personal history? Finally, you can share your personal history online by registering a Family Password. A Family Password allows your family members to view, but not edit, your personal history. They can also use the Family Password to view your My Family Tree file, if you have one, and any information you have stored in the Family News area. Since you control who has your Family Password, you control who can view your personal history.